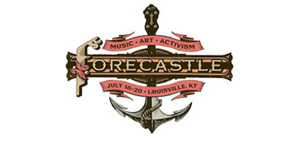 The Forecastle Festival began in 2002 and is a wonderful three-day festival taking place in Louisville, Kentucky. Not only is it an amazing experience for music lovers with an absolutely spectacular line-up each year, but there's also a range of other things going on in terms of craft beer, food trucks and other craft vendors. It has celebrated Kentucky's love of bourbon since its inception and has been highly lauded by several music publications. A forecastle is a superstructure at the bow of a ship where the crew is housed. Hard at work in the unruly sea, it's a place workers gather after a long day to unwind. A place where the people come together, for one whale of a good time. Founded in 2002 by Louisville native JK McKnight, Forecastle has grown from a neighborhood event to one of the country's most anticipated summer festivals, drawing tens of thousands of fans from across the world to Louisville's scenic 85-acre Waterfront Park.